Shields have long been an iconic part of the medieval style. Not only are shields an ideal defense in battle that allows a warrior to deflect and block attacks, but they have also long been featured as decorations in the greatest of halls and castles. And that is precisely why Dark Knight Armoury carries a full range of impressive and effective medieval shields. And at Dark Knight Armoury, our shields are good for precisely what you would expect them to be, and that is keeping you safe and looking totally awesome, both when carried and when displayed. 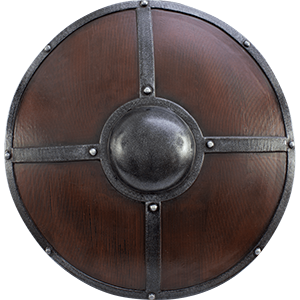 Just like the shields from history, our medieval shields are a diverse lot, coming in a variety of different sizes, ranging from round to elliptical to rectangular shields, and more. Our shields also feature a variety of designs and colors. Some mimic the look and feel of traditional medieval shields while others are designed to depict the symbols and seals of different medieval groups. Some even go so far as to depict the exact tinctures that knights used on their shields when jousting or going into battle! The end result is that our decorative shields feature some awesome designs that work wonders when displayed in dens, offices, or even bedrooms, while our functional shields will give any warrior the heraldry that they desire. And like their historic cousins, our medieval shields are also typically made from either wood or metal, either of which offers certain advantages. Metal shields, particularly the ones made from 16 gauge steel, are great for SCA reenactments, and are quite sturdy, being nearly impossible to split, shatter, or destroy. Wooden shields, by comparison, are usually lighter and do not rust. Of course, we do not just offer only medieval shields, but we also offer shields from other eras and cultures, including Viking shields, Roman shields, Greek shields, Templar shields, crusader shields, and so much more! 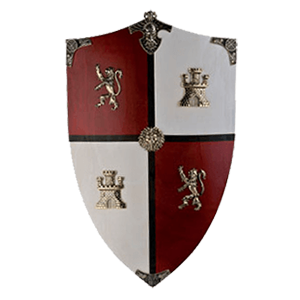 So if you are looking for a good, solid defense to carry into battle, or if perhaps you want something new and exciting to hang on your wall, then a good medieval shield from Dark Knight Armoury might just be exactly what you need. It has sometimes been said that the best defense is a good offense. This may be true, but nothing defends quite like a good shield, and that is why Dark Knight Armoury carries a huge assortment of different medieval shields, ensuring that a warrior can not only have a good offense, but also a solid defense in the form of a great shield. The metal shield is an iconic and important part of not just the medieval era, but many others as well! And do not let the name fool you, as this section contains more than just classic medieval shields. 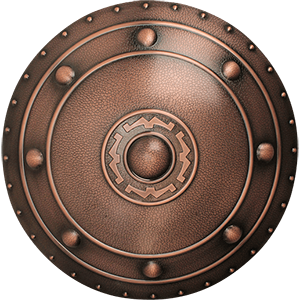 In fact, you will find shields from many eras here, and some of them are functional shields while others are decorative shields. They come in a wide variety of shapes, sizes, and materials, ranging from small Scottish targes to large Roman scutum. 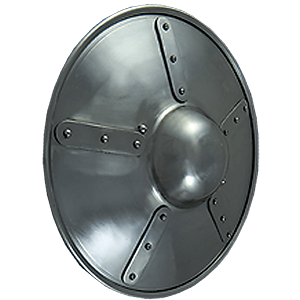 We have knightly shields, kite shields, and heater shields for the intrepid medieval warrior, as well as round shields for the Vikings and Greek warriors who might want something a bit more traditional for the older eras. Some are painted and feature stunning designs, while others are blank, allowing for you to make your own heraldry! There is no better place to stay safe from harm than behind a wall. When you march into battle carrying one of Dark Knight Armourys fine metal medieval shields, you are carrying just that - a portable, light-weight wall that will give you a great defense that you can bring to bear right when you need it. For your next LARP adventure, equip yourself with a foam shield from Dark Knight Armoury. Made of high quality, shred resistant foam, these shields have been specially formed for live action roleplay battlefields, though they also work quite well as props for medieval and fantasy themed costumes. Shop our massive assortment of shield styles, from historically inspired Viking round shields and medieval kite shields to blood spattered orc shields, shields inspired by high fantasy elves, and more, many made by trusted brands like Epic Armoury and Forgotten Dreams. Hand painting creates realistic fronts to these foam LARP defenses, so you are sure to find a foam shield here perfect for your unique character or the setting of your event. Sturdy enough to withstand the trials of training, our synthetic shields are made of high quality materials like polypropylene, which is perfect for the blows of latex and other synthetic weaponry. Train your skills or accessorize a cosplay with these authentic looking practice shields. Not as heavy as real steel or wood shields, many of these synthetic shields are ideal for training and light sparring. Practice in style with shields expertly crafted to depict authentic styles, or collect shields featuring emblems from your favorite fantasy franchises. When you want a shield that is tougher than foam but not as intense as real steel, check out the synthetic shields here at Dark Knight Armoury.